"Hamza Aziz of Destructoid, despite raising minor concerns, especially with regard to the weapons upgrades in the game, said that it is 'going to be one of the best Wii games of 2010.'" That quote up there is ripped directly from Metroid: Other M's Wikipedia entry, so you know it must be true. I did some journalism and fact checking and yes, Hamza wrote that. Did he hit the nail on the head, or was he off base and Other M is the most disappointing Metroid adventure to date? Read on to find out. Being the first Metroid directed by series granddaddy Yoshio Sakamoto in years, you’d guess that Other M would be a return to form in both mechanics and series continuity. 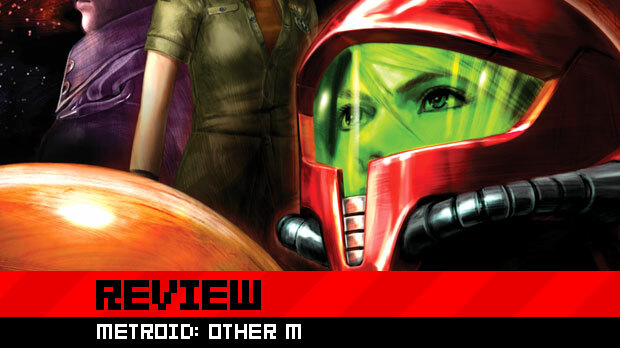 You’d only be half right -- Other M picks up the narrative torch right where fan-favorite Super Metroid left off, but manages to stray wildly from a classic formula fans have come to expect. Storywise, Other M finds itself tucked snugly between the events of the Super Nintendo classic and the Game Boy Advance’s Metroid Fusion. Samus Aran finds herself answering a distress call emanating from a latent vessel known as the “Bottle Ship.” When our heroine arrives, she finds that she’s not the only one to respond to the call -- she’s met by her old Federation Army comrades, including her commander and father-figure, Adam Malkovich. Somewhat reluctantly, the group once again teams up to discover what’s afoot on the seemingly abandoned vessel. It’s not clear from the bog standard story setup, but Other M manages to tell a captivating science fiction tale that sits neatly into the franchise’s history book, while managing to be one its best. The intention is to peel back layers of Samus’ personality and to explore her past. Here, the mostly-mute protagonist is a Chatty Cathy as the game’s narrator, calmly and confidently voiced by actress Jessica Martin. While it sticks in a few spots and can be a bit melodramatic or predictable, the story is surprisingly absorbing and at times even moving. Team Ninja also brings its cut-scene chops to the table in full force. The number of pre-rendered, non-interactive cut-scenes is staggering, with some alone lasting well over ten minutes. In fact, completing the game unlocks a “Theater” mode that will allow you to watch all of the cut-scenes in a linear fashion. Grab some popcorn and get comfortable -- this mini-movie lasts roughly two hours. Fortunately (and not surprisingly), these are high quality cut-scenes, with superb direction and visual flair that stand up rather well taken in on their own. So that’s the good news. 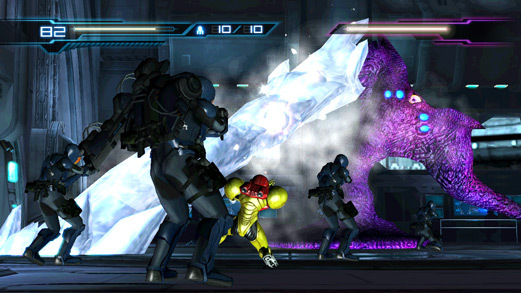 Here’s the bad: the gameplay gambles Nintendo and Team Ninja took with Metroid: Other M don’t entirely pay off, and it’s a huge blow to the overall experience. 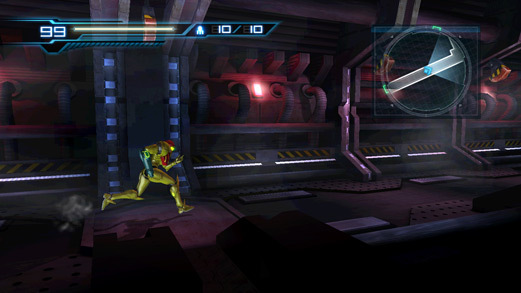 The entire game is played by holding a single Wii Remote horizontally, with movement on the D-pad and your basic actions -- morph ball, jump, and shoot -- mapped to the “A”, “1,” and “2” buttons respectively. This decision was likely to mirror the classic Metroid gameplay approach; as the game begins and you grip the controller as such, I certainly did have a few flashbacks to the first time I gripped an NES controller to explore the Planet Zebes. But that’s where the similarities end. Other M is a 3D action game through and through. Yes, there are a few areas in which you’re locked into the familiar 2D plane, but you’ll use the d-pad to move around the game’s 3D environments. The game will auto-focus arm cannon fire at enemies for you, as there is no way to lock on to potential targets. Much of the time, this works out fine; the game engine is clever enough to do the work for the player, with little hassle. But without a way to lock on, that also means there’s no way to strafe and fire at your prey -- you must be facing (or sometimes moving towards) an enemy to eradicate them. What this leads to, especially when fighting swarms of creatures, is enemies chasing you around areas while you charge up your beam, before quickly turning to blast them to hell… and then swiftly moving away again before you repeat the process. This game of cat and mouse is made somewhat more tolerable by Samus’ “SenseMove,” which is used to evade enemy attacks. By quickly tapping the D-pad directly prior to a collision, Samus will dive, roll, or flip to safety, leaving the enemy open to attack. The “SenseMove” works well, salvaging the otherwise tedious combat. 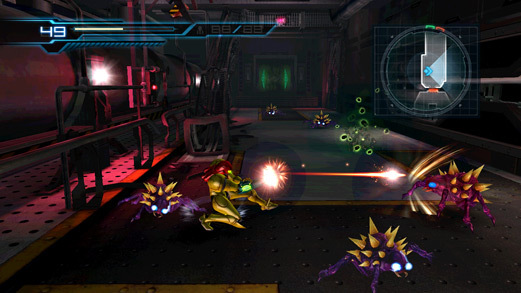 Using Samus’ missiles (along with a few other targeting items) is another sore point when it comes to the game’s controls. Curiously, you’ll need to point the Wii Remote directly at the screen, which will (in theory) quickly put you into first-person mode. Once in this view, you’ll be able to look freely in all directions, moving an on-screen cursor to target enemies and other elements of the environment. Once locked-in, you’ll be able to unleash a missile or (later on) a grapple beam to swing across gaps and such. The first problem with this is that re-positioning the Wii Remote in this manner in the heat of battle is awkward, and leaves you completely open to enemy attacks. Even worse is having to orient “center” on the screen to find your reticle, the pain of which is only trumped by the times when the Wii Sensor and Wii Remote happen to not be playing nice with one another, and you experience a quick and odd camera shift. For all of these issues, this combat is generally at its best when fighting some of the game’s massive bosses. Yes, all of the above issues are still present, but when battling one-on-one with a beast of monstrous proportions, you’ll generally run into fewer targeting and Wii Remote issues. Not having to deal with a swam of creatures attacking you for all sides (although that does happen in a few boss encounters) seems to help things a bit. And some of them are simply really damned cool, requiring you to use all of your offensive and defensive skills to bring the creatures down. 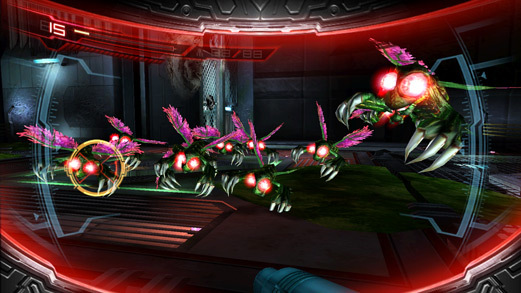 While previous Metroid games required you to explore nooks and crannies of the world map, that’s not entirely necessary in Other M. Yes, there are all manner of tanks (missile, energy, and e-recovery) that you can pick up, but they will all be marked on the map once a room is cleared of enemies. Figuring out how to get to them may be a bit tricky, but it’s not quite exploration as much as it is “poking around a room to find a ledge or hole.” The game’s story progression is incredibly linear, however. Following the on-screen navigation there are only a few dead ends blocking your path, most of which just require you to find a hole to roll through or a cracked wall to blast. You don’t explore the “Bottle Ship” as much as you just follow orders as to where to go next. Speaking of following orders, Samus will start with all of her abilities from Super Metroid from the game’s start… you just won’t be able to use them. 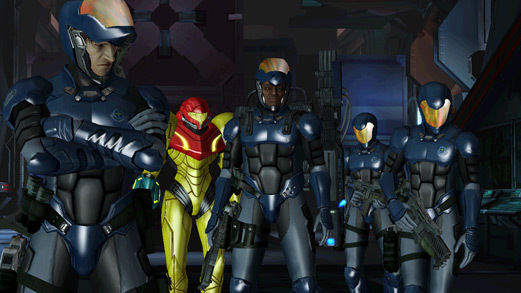 Instead, they will be “unlocked” when Commander Malkovich (who Samus is taking orders from now) “authorizes” them. He always does so at the most predictable times, too; you’ll never have to guess or figure out which weapon or item you’ll need to stop a large enemy boss or move through a room -- the game basically holds your hand and screams “It’s time to use this!” in your face. Visually Other M is a bit all over the place. On one hand, the aforementioned pre-rendered cut-scenes sometimes look like works of art. But on the other, character design is totally uneven. Samus has a soft, easy-on-the-eyes look, as do the rest of the women who appear in the game. The males, however, look like meatheads, their faces seemingly constructed from wet clumps of clay. And while there certainly are some large and impressive boss battles, some of the enemy design is debatable, with a few creatures looking like they were rejected from the Pokedex for being only slightly more frightening than a Charizard. As a Metroid fan, coming down hard on Other M for its faults isn’t easy. I was so torn with my initial playthrough impressions that I sat down and played through the game a second time, something I almost never do for review (or for pleasure). It’s not that Other M doesn’t fit my expectations of what I wanted in a Metroid game, which may be true to some extent. It’s simply that, despite a few high points, what’s here is a mostly average third-person action/adventure title. Stripped of its references to this beloved franchise, it’s likely that most gamers wouldn’t give this title a second glance. Many fans will be able to look past Other M’s many issues to find a pleasurable adventure, and I’d encourage them to, if only to experience what may be the best-told tale in the Metroid universe. Metroid enthusiasts won’t want to miss this, and nothing I could write could encourage them to take a pass. But to put it bluntly, Other M simply doesn’t meet the high-quality standards fans have come to expect from not only the franchise, but from Nintendo’s routinely-spectacular first-party line-up.